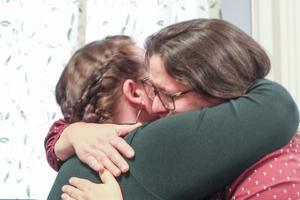 Former Blue Hill Treasurer Jody Murphy hugs a supporter after being found not guilty in Hancock County Superior Court April 9 of stealing nearly $18,000 in town funds. After 90 minutes of jury deliberations, former Blue Hill treasurer Jody Murphy, 39, was found not guilty of stealing $17,960 of town funds between October 2016 and September 2017. 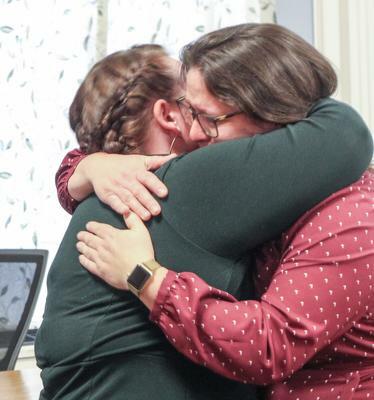 The trial lasted throughout the day, April 9, in Hancock County Superior Court, as Deputy District Attorney Toff Toffolon questioned witnesses whose testimony drew a picture of missing cash deposits, payroll irregularities and the town’s bank deposit, payroll and audit processes. Bar Harbor Bank & Trust Senior Vice President Lisa Veazie, Blue Hill Town Clerk and Tax Collector Etta Perkins, former selectman Jim Schatz, town treasurer Rebecca Wilber and CPA Ronald Bean all took the stand for the prosecution, but the cumulative weight of their testimony and the 14 records entered as exhibits failed to sway the jury of Murphy’s guilt beyond a reasonable doubt. Murphy herself did not take the stand, but said she had been ready to if needed. At one point, with the jury still on lunch recess, defense attorney Max Coolidge motioned for an acquittal. “All the bank record shows is that the money on the deposit slip didn’t get put in the bank,” he said. “All the auditor can say is money is missing. Where did it go? No rational juror can conclude, based on that evidence, that Ms. Murphy is responsible.” Coolidge also noted the town’s raising $206,000 more from taxation than needed through an error in 2016, as an example of mistakes in town accounts. Toffolon objected: “She stole the money, so there’s no evidence on bank statements. Mr. Schatz and the auditor looked at every possible place the cash could show up.” He also repeated Perkins’ testimony of finding a deposit slip in a former deputy clerk’s handwriting, and deposit slip carbon copies in Murphy’s handwriting, stuck in Murphy’s desk drawer. Justice Bruce Mallonee denied Coolidge’s motion, the jury returned to hear closing arguments, and Murphy waited, as she has since being charged on March 13, 2018 on one count of theft by unauthorized taking or transfer. She pleaded not guilty at her arraignment and has been steadfast in claiming herself innocent of the charge. She remained stoic as the verdict was read but cried in the arms of supporters and Coolidge after the trial was adjourned. While Murphy was charged with taking $17,960 in town funds, it was one missing cash amount of $7,908.35, from October 14, 2016, paid to the town the day before taxes were due that Coolidge focused on. Perkins could not recall who made the bank deposit for that day, or whether it was made the same day or locked in Perkins’ desk drawer or the town safe overnight. Stipends added to Murphy’s paycheck and a November 2018 transfer station deposit of cash and checks that never made it to the bank were never directly linked to Murphy, despite her being responsible for transfer station deposits and reporting wages to the payroll services after selectmen approved the warrant for employee wages. Schatz began an investigation after a 2017 audit showed the missing $7,908.35 cash, and other discrepancies then emerged. “If we didn’t think [she was guilty], we wouldn’t have pursued it,” he said after the trial. “We’re disappointed.” He said it’s up to the current board of selectmen to decide whether to further investigate the missing funds. For the district attorney’s office, the case is closed, Foster said. This story was updated from it’s original version on April 11 to include additional information. 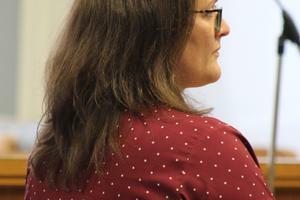 Former Blue Hill Treasurer Jody Murphy listens to witness testimony at her April 9 trial at Hancock County Superior Court. A jury returned a “not guilty” verdict to the charge that Murphy stole nearly $18,000 in town funds. 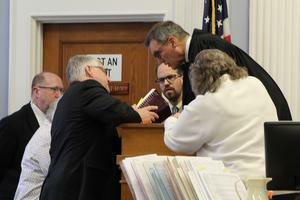 Justice Bruce Mallonee speaks with Deputy District Attorney Toff Toffolon, in forefront, and defense attorney Max Coolidge (next to Mallonee), as court personnel look on.